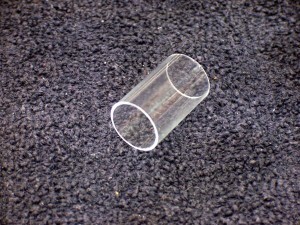 I needed to cut a piece of glass tube to a certain length and this is how I did it using my mini-lathe, an inexpensive diamond blade, some masking tape and WD-40. 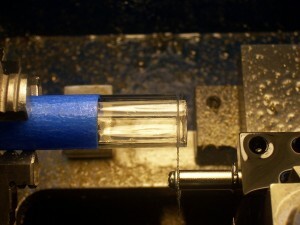 The Stirling Engine I’m building uses a glass tube for the power cylinder. 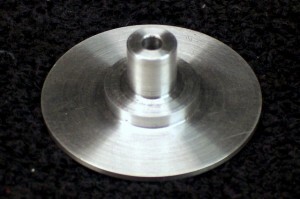 It calls for one with an outside diameter of 16 mm and a length of 26 mm (1.02-inches), although those dimensions are not critical. I thought I’d have to order a tube with the right diameter but I got lucky and quickly found a package of three 16 mm test tubes in the science kit section of our local Hobby Lobby store. They cost $3.99. I found all kinds of techniques on the Internet for cutting glass tubes and bottles. One, which I’ll call the flaming string method, didn’t look like it would create the smooth even edge that I wanted. Another video showed how to cut tubing by scoring it part way around with a carbide tool, putting a drop of water on the scratch and then pressing a red hot glass rod into the scratch. That seemed to neatly break the tube, but I didn’t have a glass rod that I could heat up. Others suggested cutting it with a diamond blade and I happened to have one of those. The blade that I used was from a set of Dremel-size diamond blades that I bought a while ago at my local Harbor Freight for only three or four dollars. They came with a mandrel which I was able to clamp in one of the tool holders for my quick-change tool post. 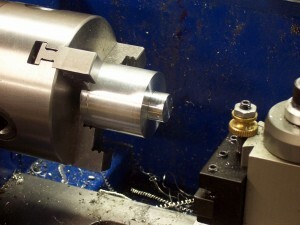 The test tube fit perfectly, and I mean perfectly, in the center hole of my three-jaw chuck. Any bigger and it would not have fit. To ensure that the tube wouldn’t slip while cutting I put some masking tape around it and just barely tightened the jaws. 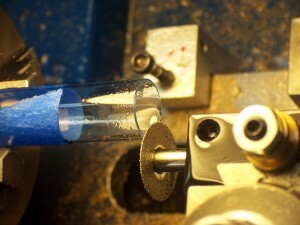 The test tube had a lip on it that would interfere with the piston so the first photo shows me cutting it off. I set the lathe in high gear and turned the speed control to almost maximum and then very, very slowly advanced the cross slide. Water is usually used as a lubricant and coolant when cutting glass with a diamond blade but I didn’t want my lathe to get rusty, so I used a squirt bottle filled with WD-40. It didn’t require much and afterward a paper towel soaked most of it up. To be safe, I wore a face shield and I recommend that you do the same. The cut edge was pretty smooth but I tried to make it even better by using the side of the blade to grind the edge. The second cut I made left an even smoother edge so I left it alone. I have a small diamond sharpener that I use to hone cutting edges and if I were to do this again I would probably try to use it like a lathe file to slightly round the edge of the rim that will be exposed when the engine is assembled. Begin by turning the shoulder the CDs will fit on. 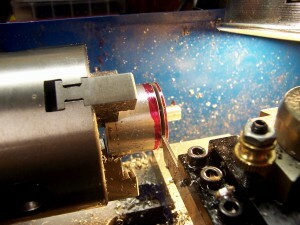 Here’s how I made the hub for Jan Ridders’ New Simpler LTD Stirling Engine. I started with a piece of 1.25-inch diameter aluminum and turned down a shoulder to fit the CDs that are used for the flywheel. This part has only two critical dimensions and this is one of them. 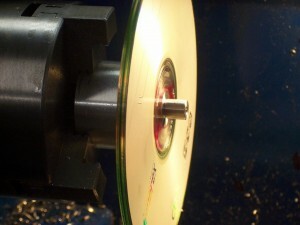 The CDs need to fit well so the flywheel will have a minimal amount of runout. The other critical dimension is the center hole. It needs to be drilled or reamed so it will fit well on the crankshaft and the hub won’t wobble when it turns. I recommend drilling the hole to fit a crankshaft made from 3/32-inch drill rod (more about this in my next post). It is also important to cut a square shoulder so the disks will fit tight against it. 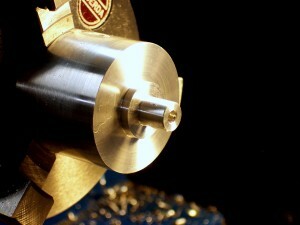 I use indexable carbide inserts and they have a very small cutting radius. So I was able to cheat and cut just a little deeper into the corner of the shoulder so the radius left by the insert would be a little below the surface. The radius ground on HSS bits is usually bigger so they might require you to clean up the corner with a parting or grooving tool, or a pointed bit. If you don’t know what I mean then see the bottom of this page where they show and explain how to turn a shoulder. The next step was to turn down the diameter that will be drilled and tapped later for the set screw used to hold the hub on the crankshaft. I also faced it down to the correct length and center drilled it. Here's how the CDs will fit on the hub. They are used as a flywheel. The hub is parted off. The flange (is that the correct term?) is too thick and the parting tool left it convex-shaped. So I flipped it around to face it down to the correct thickness. You can't see it, but I wrapped a piece of aluminum tape around the part in the chuck so it wouldn't get marred by the jaws. 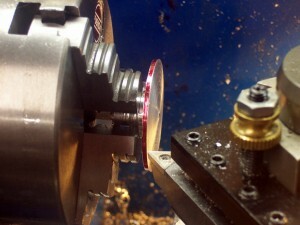 Usual Disclaimer: I’m not the most experienced machinist and there is almost always more than one way to do something. Please leave a comment if you can teach us all a better or different way of making this part.